Inside Out follows the emotions inside the head of Riley (Kaitlyn Dias), an eleven year-old girl who is coping with a move from Minnesota to San Francisco. Although her parents ask her to stay strong and be their happy girl, Riley has complicated emotions about the situation. Specifically, Joy (Amy Poehler) is trying her best to keep Riley upbeat, while Sadness (Phyllis Smith) keeps touching Riley’s memories, making her blue. Meanwhile, Fear (Bill Hader), Anger (Lewis Black), and Disgust (HRH Mindy Kaling) have a lot to say about San Francisco in general. Inside Riley’s head, there are core memories that support “islands” of her personality, such as Hockey Island, Family Island, Honesty Island, and Friendship Island. These core memories are at the heart of who Riley is. While trying to keep Sadness from touching the core memories (after Riley cries in school, creating a core memory that was not controlled by Joy), Joy accidentally gets the memories, Sadness, and herself sent to Long Term Memory. She must get back to the control center and restore the memories or else Riley won’t be herself, or happy, again. 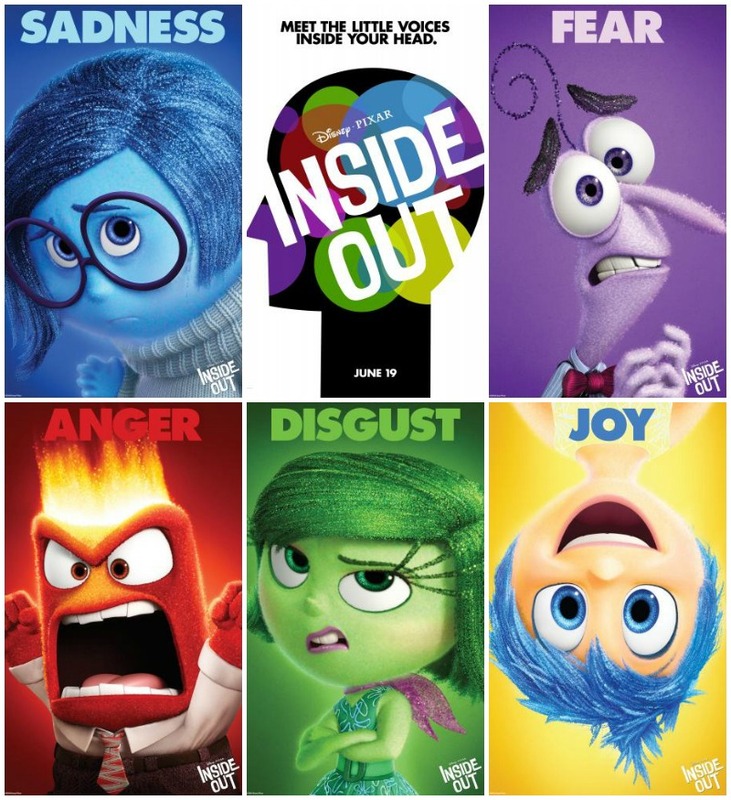 Not discounting that gorgeous opening sequence from Up, Inside Out may be Pixar’s smartest, most mature film yet. What I especially appreciate is the way the narrative actually focuses on a fairly common experience–a big move–and makes it an epic journey by following Riley’s emotions. At its heart, the film is about a girl navigating complicated feelings. There’s a lot that someone could do here with Affect Theory and the way this story presents and anthropomorphizes emotion. Additionally, the narrative touches, lightly but significantly, on the pressure that is put on particular emotions over others. Riley is asked by her mother to be her happy girl, in an attempt to help Riley’s father not be so stressed about his new job. On one hand, this emphasis on happiness in the face of change is pretty common in both parenting and contemporary culture, in which good thoughts and a good attitude are supposed to overcome all obstacles. On the other hand, there is a gendered nuance to the expectation for Riley to be happy and joyful, even when the move has taken away her favorite places and people. On a personal note, I am a Midwestern girl about a month away from moving to the San Francisco Bay Area. I have my own mixed emotions and this movie just made me weep openly in a way that was cathartic and helpful and pleasing. Why do you think Joy and Sadness were the first two emotions? Which emotions do you think most control how you react to things? What is disgust? Describe a time when you felt disgusted. What are you most afraid of? How might Fear react to your nightmares? Describe a time when you had mixed emotions. Can you imagine what the conversation between those emotions would be? Was if fair for Riley’s mom to ask her to be happy for her dad? What are the islands of your personality? What are some core memories that you think shaped who you are? Do you have a memory that used to be happy, but now you feel sad about? Why? How do our feelings about events change over time? Do you think people like some emotions more than others? What does that tell us about how people expect us to behave? Is it okay to act differently? Is there a time in which you expressed emotions and were embarrassed by them? Why were you embarrassed? Is it okay to be vulnerable? What was your favorite part of Riley’s brain? Why? How did the different parts of the brain work together to create Riley’s experience of the world? What are some moments in the film in which feelings lead to conflict? How might the conflict have been avoided or resolved? How does Riley grow at the end of the film? How does Joy grow? What about Mom and Dad? Is there a reason for the gendering of certain emotions? (Why are Joy, Sadness, and Disgust female and Anger and Fear male?) Are there stereotypes present in the film’s depiction of emotion? Do you have any questions about emotions, how to express them, or how to cope with them?